Unique semi-deep socket end provides extra bolt clearance. High-polished cleans easily 12 point socket end provides maximum versatility. Recessed corners in socket end provide extra turning power. 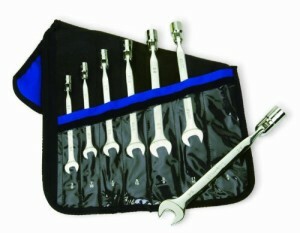 Deluxe roll pouch with clear front and Velcro fastening keeps wrenches organized and visible.